Whether you eat them as a snack or drink them in the form of a smoothie, grapes never fail to satisfy. Not only are they delicious but they are also packed with minerals, vitamins, and antioxidants. Adding this fruit to your diet can benefit your eyes, your heart, your brain, and protect you against several diseases and ailments. There are several types of grapes, coming in varying colors including green, red, yellow, pink and black. Some of these types come with seeds while others are seedless. Regardless of which type of grapes you go for, the benefits for health they bring are vast. Grapes come loaded with antioxidants that repair and reduce the damage caused by free radicals. If left unchecked, free radicals can cause oxidative stress which is linked to several chronic diseases. Eating grapes can help prevent the development of several diseases such as diabetes and cancer. Grapes can also save you from certain types of cancer. This is because the fruit is packed with plant compounds that have been shown by research to be able to prevent and even treat cancer. The plant compounds that grapes comprise of include resveratrol, anthocyanins, and catechins. Chronic inflammation is often responsible for causing chronic diseases. This fruit brings along strong anti-inflammatory properties as it has resveratrol in it. This element prevents the development of metabolic syndrome, arthritis, heart disease, autoimmune disorders, diabetes, and many other ailments. Eating grapes doesn’t only appeal to your taste buds but it also wins your heart. Grapes come with qualities that enable them to boost heart health and protect against heart-related ailments. This is because grapes can lower blood pressure levels. They can also reduce bad LDL cholesterol markers. Grapes also have impressive benefits for your visual organs. They can protect your eyes from diseases. 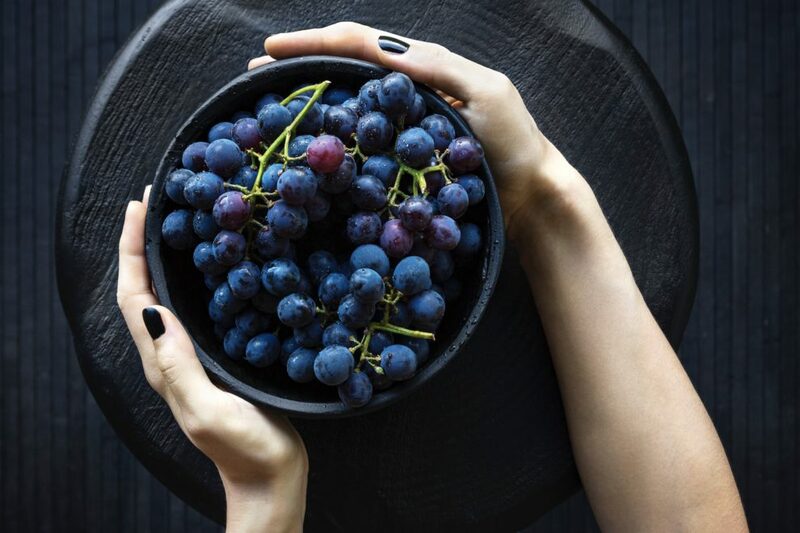 The resveratrol in grapes can protect retinal cells against UV light and in turn, lower the risks of developing age-related macular degeneration. This compound can also protect the eyes against glaucoma, cataract, and diabetes. Another health-related pro of eating the grape fruit is that it may also enhance brain health. It can improve one’s memory and grant one heightened focus and attention. It can also improve one’s learning skills and boost one’s mood. What’s more, the resveratrol in grapes may also protect against Alzheimer’s disease. However, more research is needed to confirm this. Grapes contain minerals that are great for your bones. They have an arsenal full of magnesium, calcium, manganese, potassium, and vitamin K. These minerals can protect your bones and promote their health.